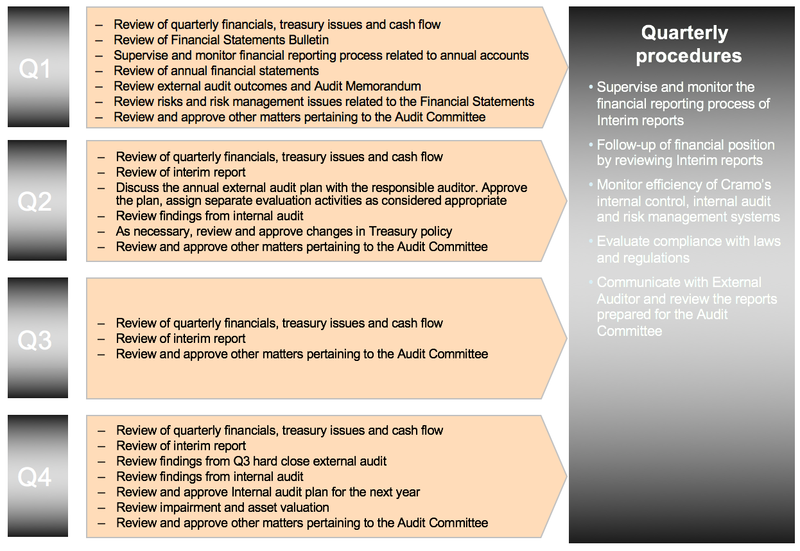 The Audit Committee assists the Board of Directors in its supervisory responsibilities. Assessing the effects of any exceptional or significant business transactions. The following picture describes the Audit Committee’s operating calendar. Until 28 March 2019, the Audit Committee was chaired by Mr Joakim Rubin, with Ms AnnaCarin Grandin and Ms Caroline Sundewall as committee members. At the Board’s constitutive meeting on 28 March 2019, Mr Joakim Rubin was appointed as Chairman of the Audit Committee, and Ms AnnaCarin Grandin and Mr Christian Bubenheim were elected as members. Mr Rubin was deemed independent of the Company, but not independent of a major shareholder. Until 28 March 2018, the Audit Committee was chaired by Mr Joakim Rubin, with Mr Perttu Louhiluoto, Mr Erkki Stenberg and Ms Caroline Sundewall as committee members. At the Board’s constitutive meeting on 28 March 2018, Mr Joakim Rubin was appointed as Chairman of the Audit Committee, and Ms AnnaCarin Grandin, Mr Perttu Louhiluoto and Ms Caroline Sundewall were elected as members. Mr Louhiluoto and Ms Sundewall were deemed independent of the Company and its major shareholders. Mr Rubin was deemed independent of the Company, but not independent of a major shareholder. The Audit Committee met eight times in 2018.